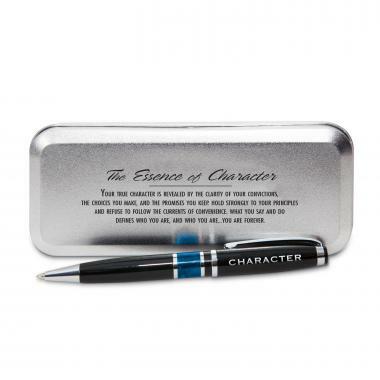 Used as a gift or recognition, this Essence of Character blue marbleized pen with a stainless steel case transcends the ordinary. The pen has polished chrome accents and the word "Character" embossed on the middle ring below the clip. Ready for presentation - the case features a relevant and motivational quote printed in black.